Ail-Kar, a white-hole portal from another universe, rains meteoroids onto the surface of the planet Kelanni. But the so-called "lodestones" behave according to different physical laws, transforming Kelanni's society. With the aid of the fearsome Keltar in their flying cloaks, the Kelanni are being put to forced labor to mine the lodestones. Shann, an orphan with a fiery disposition, witnesses a battle between a Keltar and a stranger bearing a similar flying cloak. She tracks down the stranger, and learns of the technology behind the Keltars' power, joining him on a mission to free the slaves and cut off their supply of lodestones. Meanwhile Keris, a Keltar, is sent on a mission to track down the rebels. She is attacked by a flying creature and saved by the enigmatic Chandara. At their Great Tree, she learns that a mysterious "Prophet" is out to destroy the Kelanni people. Their only hope is a powerful instrument hidden in the distant past. Pursued by Keltar, the party will encounter bizarre creatures, ancient technologies and terrifying dangers. Finally, they must seek to cross a massive storm barrier in order to reach the other side of their world, where a world-shaking revelation awaits. I'm not usually a science fiction fan, but this book had me from page 1. The book is very fast paced, they are constantly on the move and there are few, if any, slow paragraphs. The descriptions of the surrounding world are fantastic and colourful, and bears witness of a land and zoology entirely different from ours - and it works.The Lodestone concept is really clever and well thought through. So is the Kelanni race (human-like), the Keltars (disciples of the Prophet) and their flying cloaks, and the entire world, it's set in. It is so completely different and it's absolutely brilliant. The book plays with the laws of physics, but it never gets boring. The main characters consist of an unlikely group, and the book tells the story through the perspective of Shann and Keris; Two women, both on a journey to discover who they are and what they're capable off. The characters are in general very well written and likeable (the good guys at least), but I do think that things went a bit too fast sometimes. They are a bit too accepting and willing to believe and rely on the word of a total stranger, despite it being the total opposite of anything, they ever thought they knew. Gut feelings can only get you so far, after all. 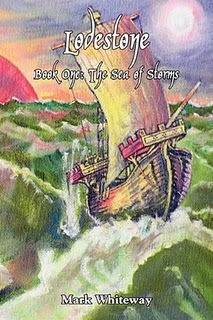 Lodestone, book one: The Sea of Storms is only the first part of the story, and ending in a cliffhanger I'm very much looking forwards to getting my hands on the next book, Lodestone Book Two: The World of Ice and Stars, and find out what happens. Many thanks to author Mark Whiteway for supplying me with a copy to review.